Composer Bedřich Smetana was born and lived the first years of his life in the brewery building of the Litomyšl chateau (just opposite the entrance to the main chateau building). 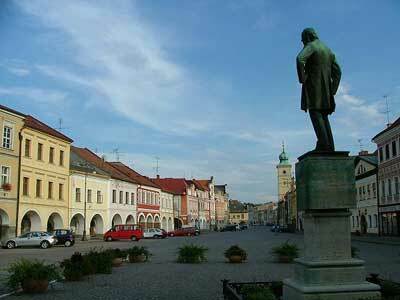 The main square of Litomyšl is named after him and his statue watches over its northern end. Possibly the most influential musician in Czech history, Smetana’s work is inextricably interconnected with the Czech National Revival of the mid-nineteenth century and to this day he is considered the father of Czech national Music. 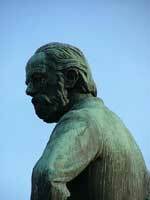 Smetana possibly inherited his early feel for music from his mother, who is said to have danced at carneval celebrations until midnight before giving birth to her only son at 10am the next morning. Young Bedřich gave his first concert performance at the age of six and went on to compose such things as The Bartered Bride and My Country (part of which was used as the music for the national anthem). The annual Smetana’s Litomyšl opera festival takes place over a period of three weeks in late June and early July every year, and attracts opera companies and fans from across Europe. Lesser known, but perhaps just as interesting, is the Smetana Youth Music Festival, for young composers and musicians, which is held every year in late autumn. For visitors to Litomyšl, the Smetana family home has been restored and is accessible to the public. The rooms are conservatively furnished in the style of the day and there’s some historical information and recorded music playing in the background. There are four rooms interconnected and you can stroll through at your own pace. Some of the information is interesting, but everything has been so thoroughly restored, cleaned and polished that it’s difficult to imagine anyone ever having actually lived there. The entrance fee is only 20Kč, but unless you really have a special interest in Smetana or some extra free time to fill in, it’s probably not among the best of the sights that Litomyšl has to offer. Of the six or seven historic sites that I visited in Litomyšl, it’s probably the only one that I wouldn’t really be interested in seeing again next time. If you’d like to visit though, it’s open April through September daily except on Mondays. Another good way to honour Smetana’s memory is to spend some extra time by the fountain in the monastery gardens, which plays recorded versions of his compositions that seem as if they were written to be used for the purpose.